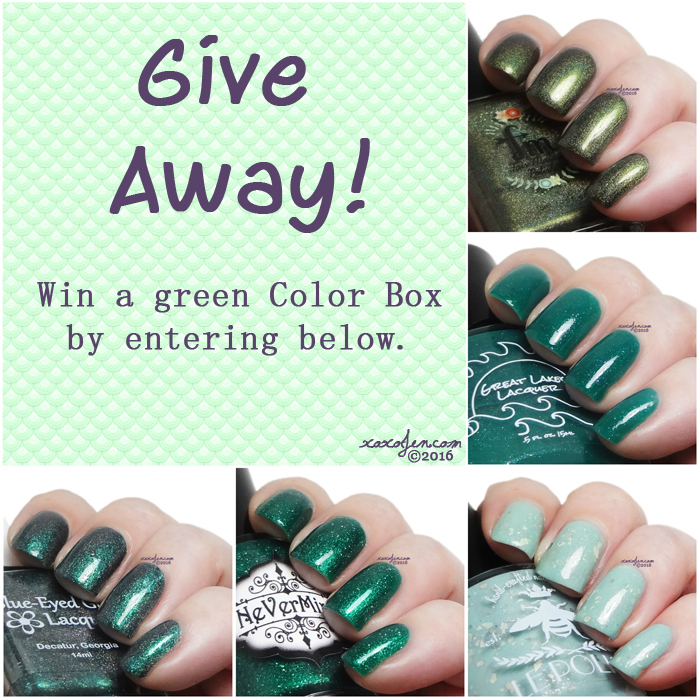 The Color Box is a blogger and brand collaborative box lead by Julie from Blue-Eyed Girl, Manna from Manna's Manis and myself. 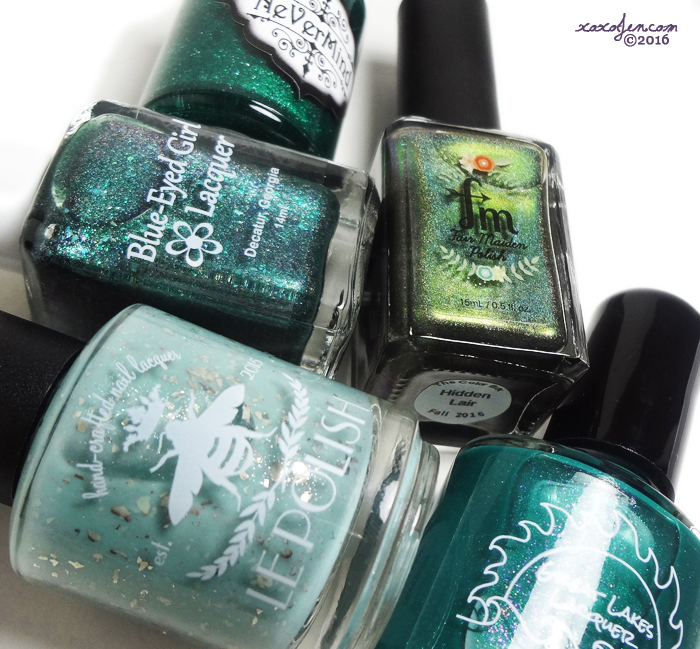 The idea was to have a single color themed box of custom blogger designed polishes. In each box we invite new and well-known brands and bloggers. The fans vote for the color, and the box is a pre-order launch that lasts a full week. 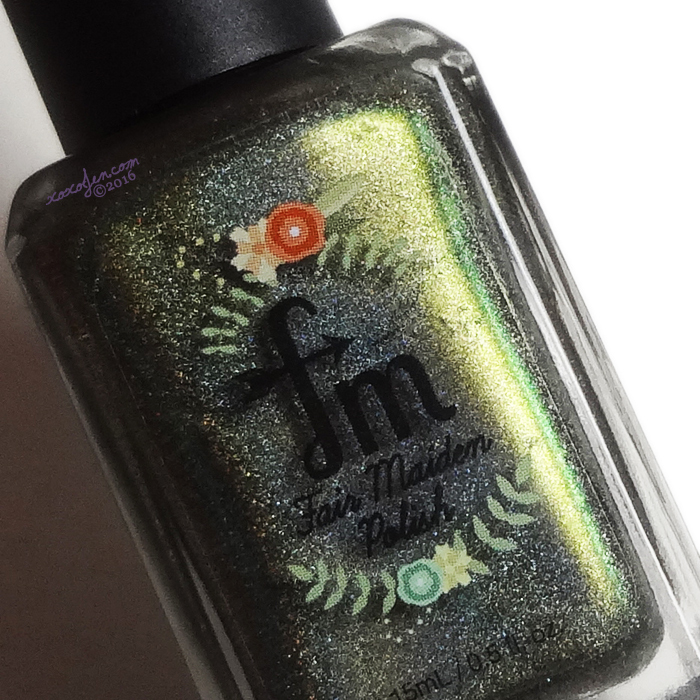 Each brand also has the option of listing their polish in their own shop after the box has been shipped. 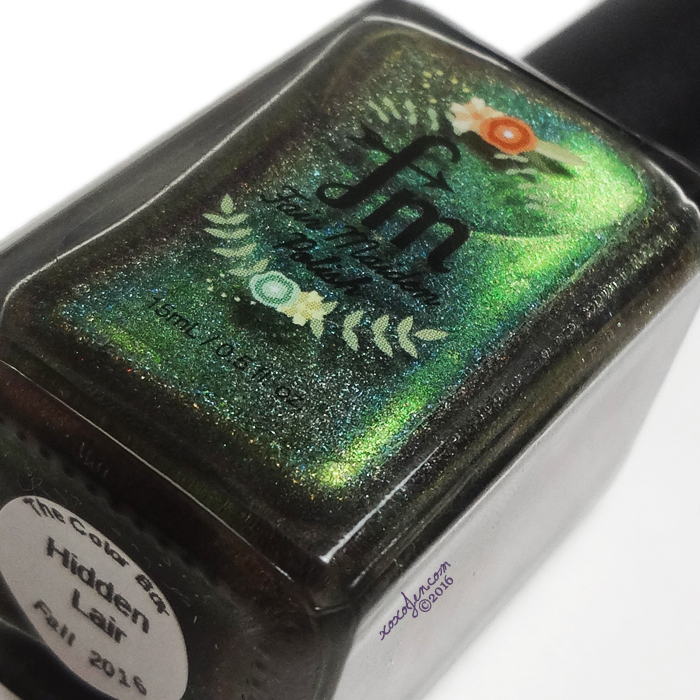 After having met Adrienne & Sarah at Polish Con Chicago, it was an amazing pleasure to work with Fair Maiden to create a Color Box polish. I was very impressed with their skill in creating what I had envisioned on the very first try! 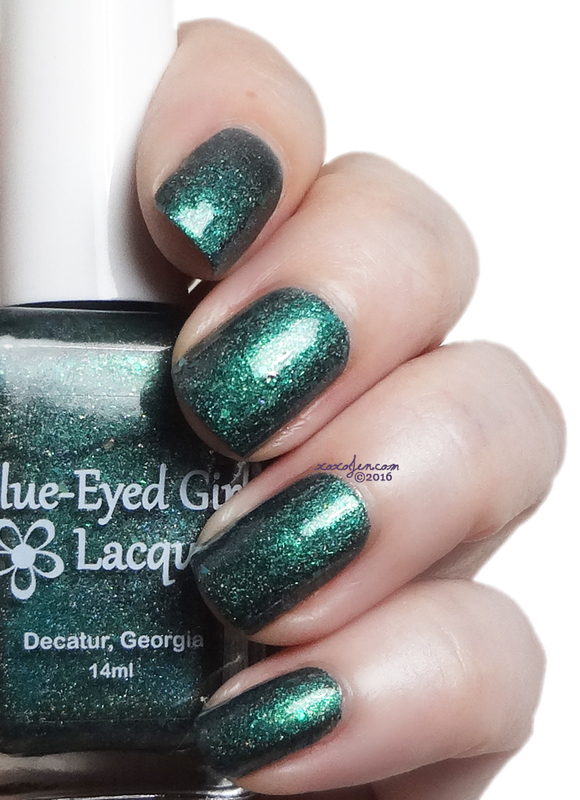 These ladies are super talented - if you haven't tried their polishes yet, you definitely should! 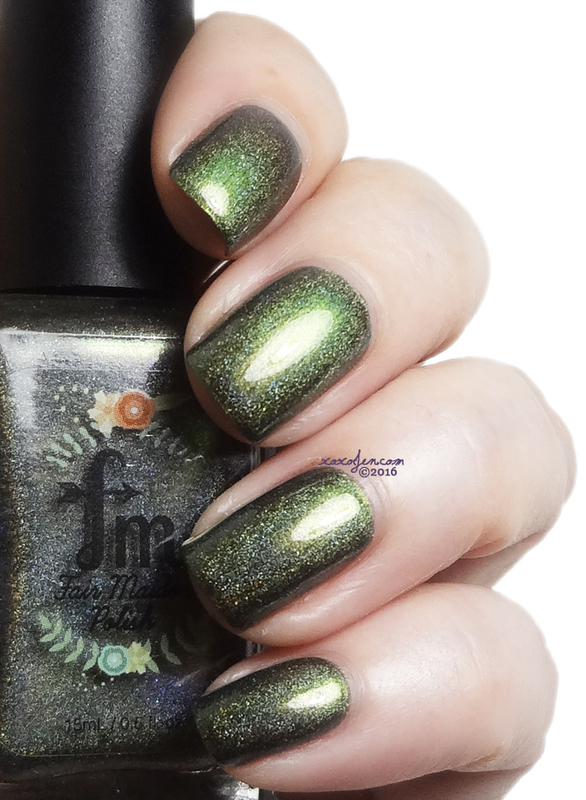 xoxo, Jen & Fair Maiden - Hidden Lair - A medium shade of a lime leaning olive green with a super holo flame. Varied lighting brings out a lime glow from within. This is a one coater! I always swatch with two though, so this is two coats with topcoat. I wore this polish for more than a week, and it never chipped. 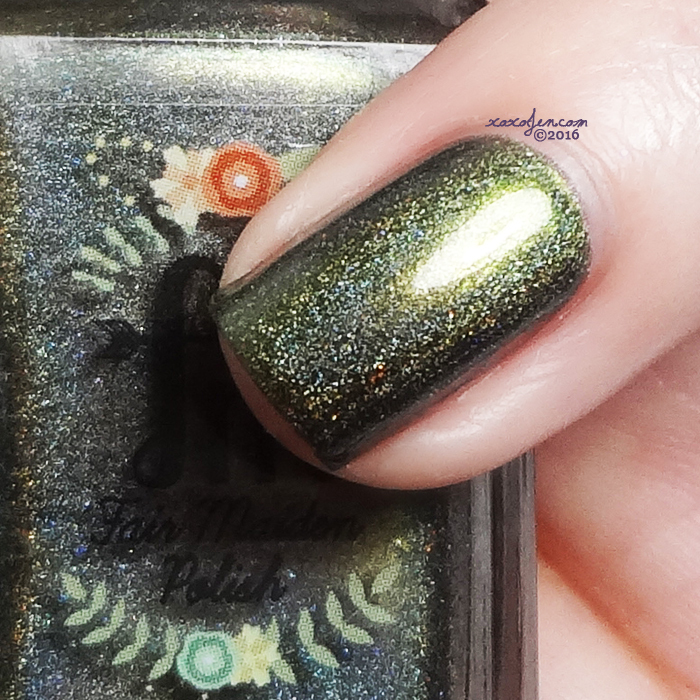 Swatch photos are all taken under the same lamp, just at different distances and angles so you can see the many faces of this polish. The first three swatch images are my usual positioning from the light source. I hope you love Hidden Lair, I certainly do. 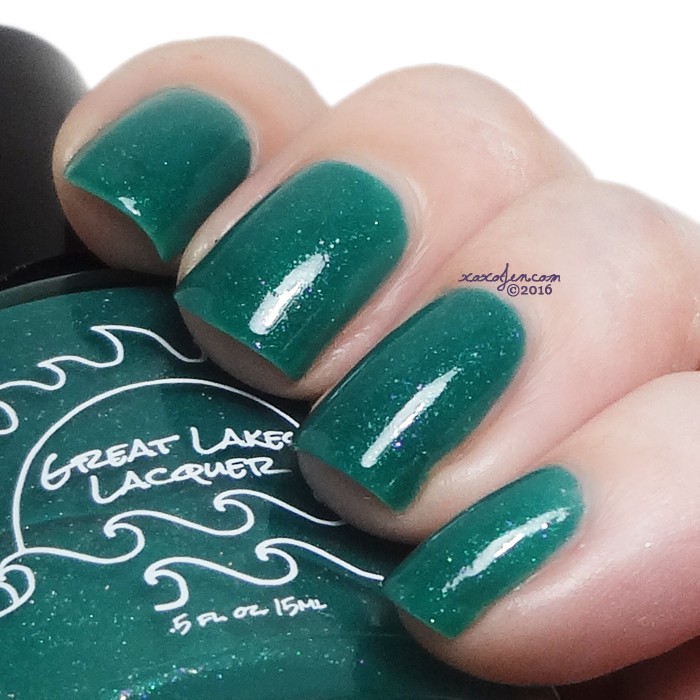 Manna’s Manis & Great Lakes Lacquer - Manna's Magical Masterpiece - Sea Green with blue to green shifting shimmer, purple shimmer, and a dash of scattered holo. 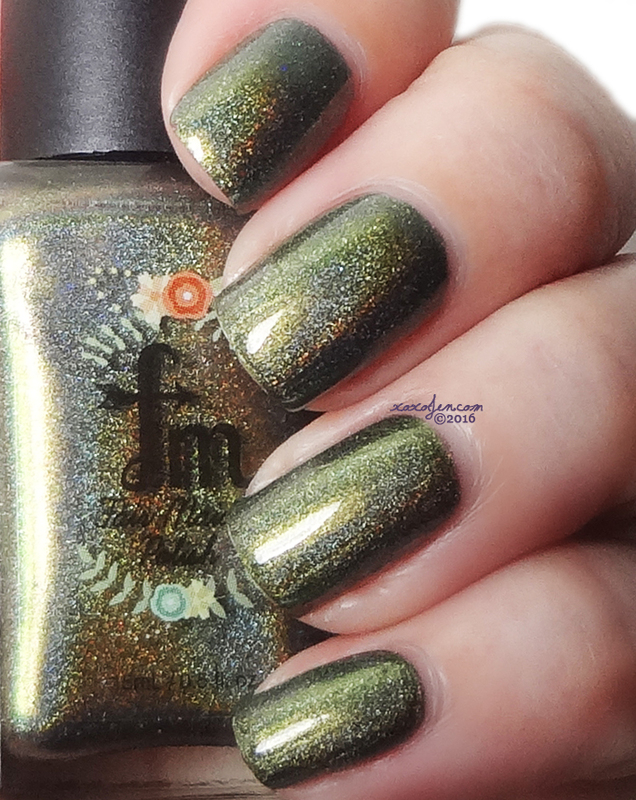 I wore three coats of this shimmery goodness along with topcoat. The formula was fluid and super easy to apply. I use a heavy hand when I paint, so I wanted to mention this is a bit sheer and may need more coats if you paint with a lighter touch/thinner coats than I do. Ida Nails It & LE Polish - Succulent Stargazer - a light jade green crelly with silver and pink shimmer and pink microflakes and platinum mega flakes. Loving this calming soft shade of green with a bit of glam. I wore two coats with topcoat. Formula was smooth and easy. 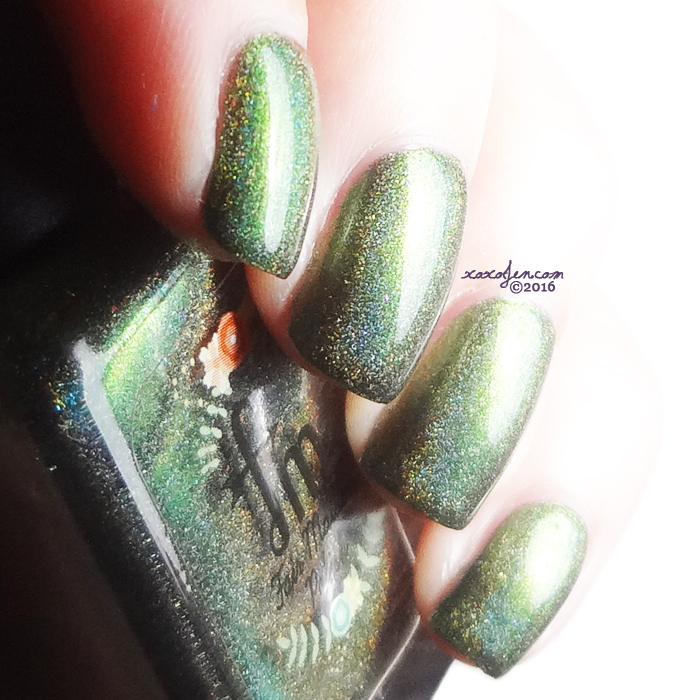 Just The Polished Tip & Nevermind - Princess Ozma - Shimmery emerald green with holo micro flakies. 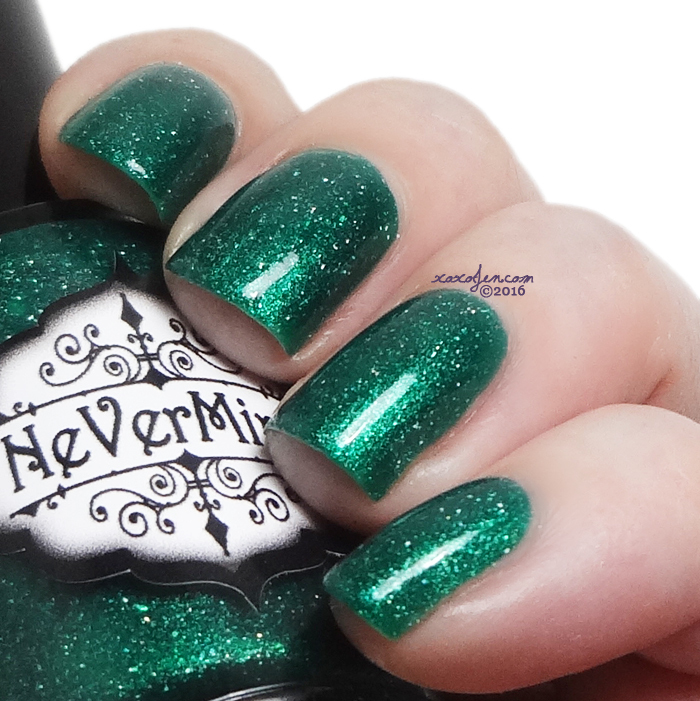 Fairly new to the Indie scene, Nevermind launched their brand at Polish Con in September. I think that they and Karina from Just the Polished Tip did a wonderful job with their polish. 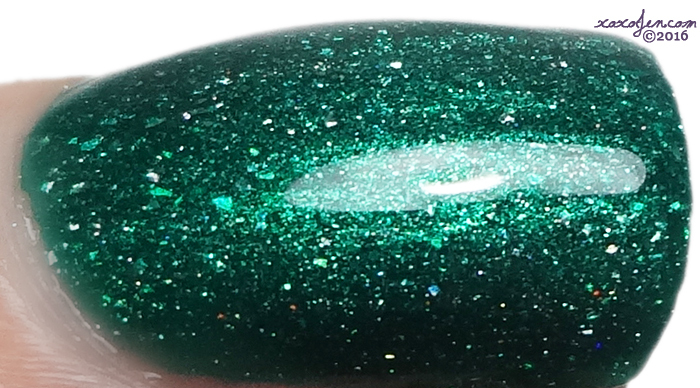 It's such a vibrant, rich shade of green packed with holo sparks! I wore two coats, love the brush and the bottle cap (unique!) and the fancy labels. Formula was fantastic, I look forward to seeing what the future holds for Nevermind. 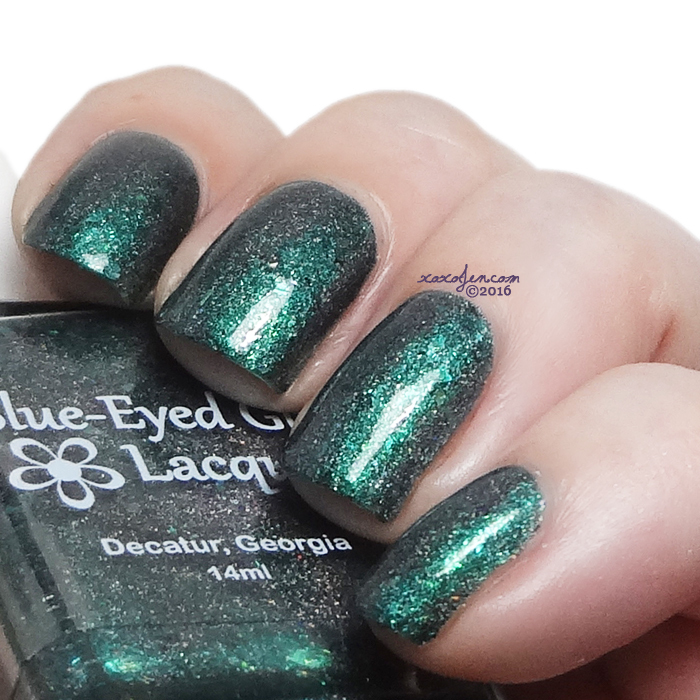 The Polished Hippy & Blue-Eyed Girl - Green's Alexandrite With Me! - Deep green holographic with two types of green to purple shift, green-blue-purple UCC flakes, and aqua to green Shifting flakes. 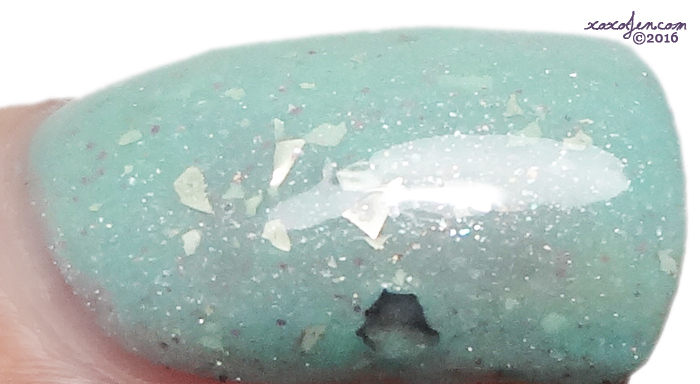 Loving the shiftiness of this, totally nailed the gemstone it's inspired by! 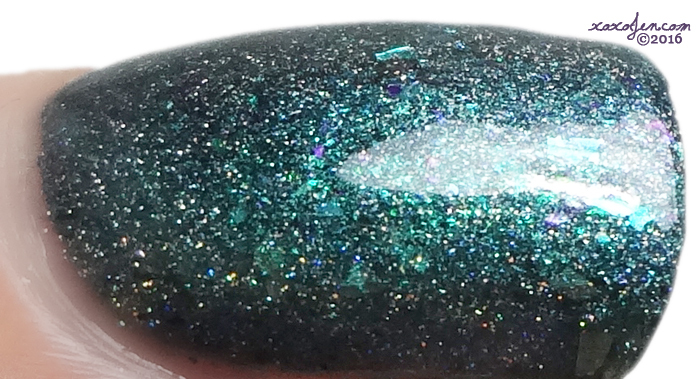 I wore two coats of this glimmery mystical polish with a coat of topcoat. Formula was fantastic! The box pre-order starts on November 25 and runs through December 2 at The Color Box shop. We also have a facebook group and an Instagram account - come join us! Loved seeing your swatches of all these great colors! All these polishes look amazing. 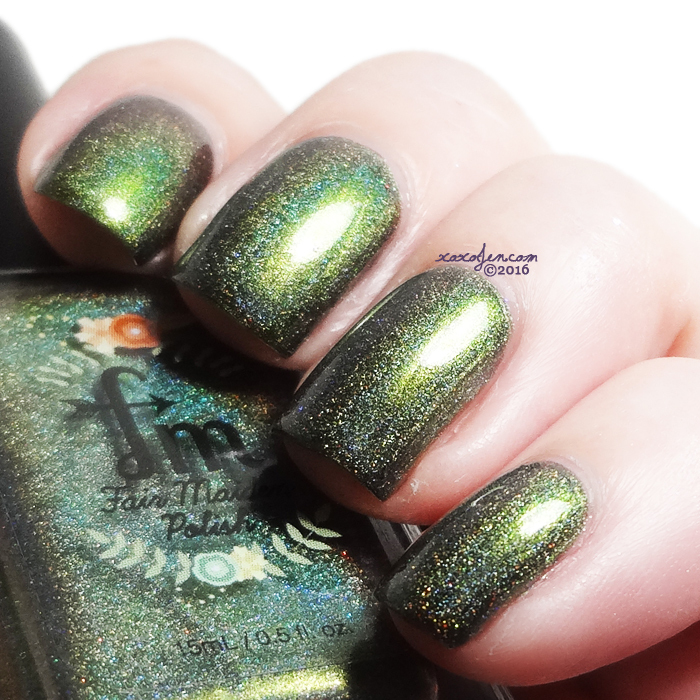 I love green polish this much "\_____(''o)_____/" !! 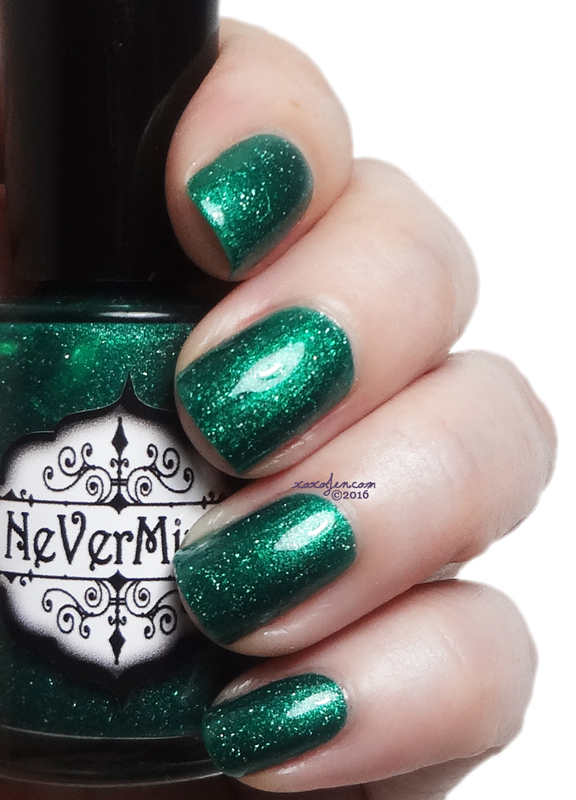 I don't wear green clothing at all, but I do love green polish, there are so many possibilities with it. You made all of these look ah-maze-ing. Great job! Some nice green polishes in this box. Thank you for the chance! These are gorgeous! Green is my favorite color, and FM my favorite maker! Love them all though. Great review! Thank you! The Fair Maiden gals are brilliant at creating! Green doesn't get the recognition it should. I believe there's the right green for everyone! Green is my favorite color! I worked with a woman who HATED that I wore green nail polish because it was so 'unnatural' so I made a point of sitting next to her at meetings on days when I had on green polish. Evil! Green is my fav color!